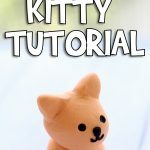 Today I’m going to show you How to Make Buttons With Polymer Clay! These are easy to make, washable, and can be made to match any fabric you have. 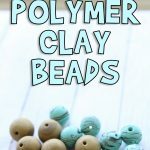 Haven’t worked with polymer clay before? 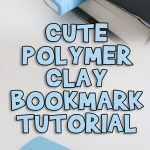 Check out my Introduction to Polymer Clay for how to get started. I’m going to show you how make make three different button designs today, so here’s what you’ll need! 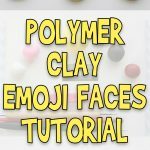 Clay in whatever colors you would like to work with. Porcelain tile or other work surface. Hole tool or needle tool. Depending on what size buttons you’re making. Texture tool. I used a texture roller, but you can use a texture plate or even a rubber stamp. First I’m going to show you how to make a plain, single color button. Warm up your clay, and roll it into a log. Then cut off equal sized slices for how many buttons you want to make. This just helps you make evenly sized buttons. Take one of your slices and roll it into a ball. Then take your clay roller and roll it into a disc. It takes a bit of practice to get an evenly round disc, so don’t get discouraged. Now, grab your hole or needle tool. Poke two (or four!) evenly spaced holes into your button. Then turn your button over and poke the holes again so they look clean on both sides. Turn your button back over to the front side, and you’re done! Go ahead an set it aside to be baked. Now, let’s make a textured button! Create your disc the same way we did for the silver button, and then roll (or gently press) your texturing tool over the top of your button. Now just create your holes the same way we did for the silver button. It’s so easy! Set this one aside to be baked. Now let’s make a marbled button. Take two or more of the colors you want to use, and roll them into balls. Then roll them into thin logs. Stack the logs together, and twist them. Fold the twist in half, and twist it again. Then roll the whole thing into a ball. 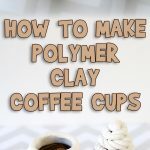 Make sure not to squeeze or knead the clay, or it will blend the colors instead of marbleizing them. Now roll that ball into a log, and cut off as many equal slices as you want buttons. Roll your slices into balls, and them use your roller to flatten them into discs. Then just create your button holes, and you’re all done with your marbled buttons! Go ahead and place all your buttons on a piece of copy paper. This helps prevent shiny spots on the back of the buttons. Now bake your buttons according to the clay manufacturer’s instructions. I used Sculpey, so I baked mine at 275 F for 15 minutes. And you’re all done! 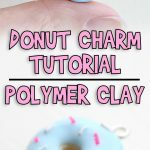 I hope you enjoyed learning how to make buttons with polymer clay today!